I am currently a Delivery Manager for MuleSoft and the Anypoint Platform, from October 2018 to present. 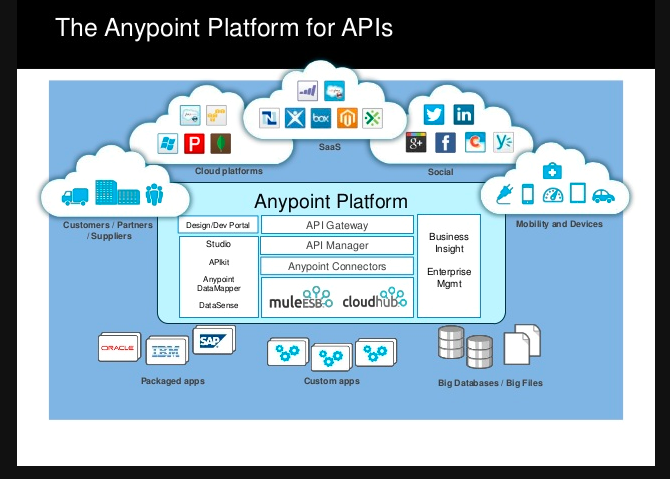 MuleSoft’s Anypoint Platform is the leading enterprise platform for building APIs, integrations and application networks. Uniquely built as a single solution, Anypoint Platform is optimized for designing, developing and managing APIs and integrations that can be deployed on-premises, in the cloud or hybrid. a) Query and transform data (e.g. JSON, EDI, XML and Cobol Copybook) using DataWeave, in real-time or batch, and filter, aggregate, and sort data of any volume. b) Build integrated and unit tests automatically with MUnit the Mule application testing framework. Leverage both mocked and active data during test execution and use tests in your CI/CD pipeline with complementary support for Jenkins, Maven, Git and more. Mule powers Anypoint Platform as the singular run-time engine for APIs and integrations, deployed to the cloud, on-premises or hybrid. Use Mule for synchronous or asynchronous integration in real-time or batch execution. Mule’s distributed architecture with message replication and persistence ensures zero message loss, availability and reliability. Mule SDK is a software development kit with a simple annotation-based programming model for extending Mule to create reusable connectors, routers and modules. Mule SDK injects cross-cutting functionality like streaming, media-type handling and re-connection into existing modules without the need to rebuild them. Anypoint Platform can be seamlessly deployed anywhere: public or private clouds, on-premises and hybrid. MuleSoft supports all deployment models for development, deployment and management. CloudHub is a fully MuleSoft-managed cloud solution without the need to maintain or configure hardware. It is highly available, multi-tenant solution with 99.99% up-time, and global run-time deployment options across 12 regions. Anypoint Runtime Fabric is a container service that orchestrates and automates Mule run-time deployment across Microsoft Azure, Amazon Web Services and data centers. Gain the benefits of a cloud solution on-premises with automated application isolation, zero-downtime re-deployments and horizontal scalability. Manage all aspects of Anypoint Platform, whether on-premises or in the cloud, with Anypoint Management Center. 1) Access Management: provision users and groups with the right access to resources and functionality within Anypoint Platform. Leverage pre-built integration with LDAP and single sign-on solutions, like PingFederate, OpenAM and Okta. 2) API Manager: Manage, proxy, version control, and secure APIs. Use pre-built policies provided by MuleSoft and add or reuse custom policies. 3) Runtime Manager: Deploy and manage APIs and integrations in the cloud or on-premises. Automate deployments by using run-time APIs and plugins for existing frameworks. 4) Anypoint Analytics: Get full visibility into the business transactions and events of your integrations and analyse data across one or multiple APIs with customizable dashboards. 5) Anypoint Monitoring: Identify issues, map dependencies, monitor application health, and manage logs in one unified interface. 6) Anypoint Visualizer: Gain a real-time, holistic view of all running APIs and integrations and how they’re connected, and troubleshoot quickly with error rates, throughput, and response time segmentation. 1) Apply edge protection to all API gateways to guard incoming traffic for any irregularities or breaches. Encrypt traffic with SSL/TLS handshakes and certificates and protect applications against malicious content threats and distributed denial of service (DDoS) attacks. 2) Mitigate risk of breaches as data moves across the enterprise. With format preserving, vaultless tokenization, protect data at rest or in-flight and meet PCI/ PHI/ PII compliance and data residency requirements like GDPR. Anypoint MQ is a multi-tenant, cloud messaging service that is infinitely scalable. It supports advanced asynchronous messaging scenarios such as queuing and pub/sub. Anypoint MQ can also support in-memory messages, time-stamping and non-repudiation logic built on Mule applications. Object Store persists data for retrieval across any cloud deployment models. Use it to store state between messages, and to share temporary data across Mule workers for watermarking variables and API caching. MuleSoft’s mission is to help organizations change and innovate faster by making it easy to connect the world’s applications, data and devices. With it’s API-led approach to connectivity, MuleSoft’s market-leading Anypoint Platform is enabling over 1,000 organizations in approximately 60 countries to build application networks. For more information, visit www.mulesoft.com.